Nonetheless, I believe that all pets should be well mannered, and pooping on people is not good manners. Therefore, I feel that potty training should be employed for a happier coexistence with your pet bird. It is true that you can potty train your bird. Don't expect your bird to return to its cage when it has to eliminate but, it will be able hold it for reasonable about of time until you can get it to a place that it is allowed to drop. The principle behind this training technique is that your bird needs to relieve itself every 15 to 20 minutes. The technique is simple. Each time you take your bird out of its cage, immediately place the bird onto its playpen. As you are waiting for the bird to drop, repeat a key word that you will use to trigger the event. I use "Dump". One of our customers says "Do your Poopie". Missy uses "Go Poo Poo". Any word you choose will work. The key words are important because they will be a cue to let your bird know what you expect. 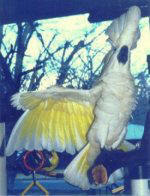 If your bird does not go within 2 to 3 minutes, take the bird off of the playpen for a couple of minutes. Then place the bird back onto the playpen until it goes. Repeat the process until the bird poops. Your bird is not allowed off of the perch for any extended period of time until it has dropped. The bird's reward is getting off of the perch to be with you. Lots of verbal and physical praise is important when they go where they are supposed to go. While the bird is out of its cage, it is important to return it to the playpen every 15 to 20 minutes, make it stay there, and repeat the key word until the bird drops. When your bird poops, its reward is coming off of the playpen to be with you and to receive more praise and petting. Once your bird begins to recognize the key word, you can say it before you remove your bird from the cage and he will learn to poop before he comes out.